4:12Beloved, do not be surprised at the fiery ordeal that is taking place among you to test you, as though something strange were happening to you. 13But rejoice insofar as you are sharing Christ’s sufferings, so that you may also be glad and shout for joy when his glory is revealed. 14If you are reviled for the name of Christ, you are blessed, because the spirit of glory, which is the Spirit of God, is resting on you. 5:6Humble yourselves therefore under the mighty hand of God, so that he may exalt you in due time. 7Cast all your anxiety on him, because he cares for you. 8Discipline yourselves, keep alert. Like a roaring lion your adversary the devil prowls around, looking for someone to devour. 9Resist him, steadfast in your faith, for you know that your brothers and sisters in all the world are undergoing the same kinds of suffering. 10And after you have suffered for a little while, the God of all grace, who has called you to his eternal glory in Christ, will himself restore, support, strengthen, and establish you.11To him be the power forever and ever. Amen. When I was in Germany I took a tour of an art museum. The tour guide was a devout Catholic, and did not hesitant to share, not only what she knew about art, but also her opinions about religion. We stopped before one statue of a Mary, and the woman explained out this was from the school of Cologne, which you could tell because of the S shaped curve in Mary’s body, but also that that Mary bore the body of Christ, and that in America they had torn the body of Christ apart because of all the different denominations there, and how could not be whole because of the way we had split up the church. Had I been a less gracious guest, I might have pointed out that the denominational thing started with Martin Luther, who was a German. I further could have pointed out the first real big split in the church was in 1054 when the Roman Catholic Church split off from the larger Eastern Orthodox Church over the role of the pope and the addition of three words in the Nicene Creed. It seems that we don’t need many excuses to split apart as Christians. You notice in my benedictions I hold up three fingers. That is not because I used to a boy scout. I picked this up from the Russian Orthodox Church. The three fingers stand for the Father, Son and Holy Spirit, and the Spirit finger is bent toward you to indicate that the Spirit of God has come to us. However the way one makes a the sign of the cross was a reason for a major split in the Russian Orthodox Church, along with the way one processed around the sanctuary during the service—clockwise or counter clockwise. The Presbyterian Church is not at all immune to any of this. 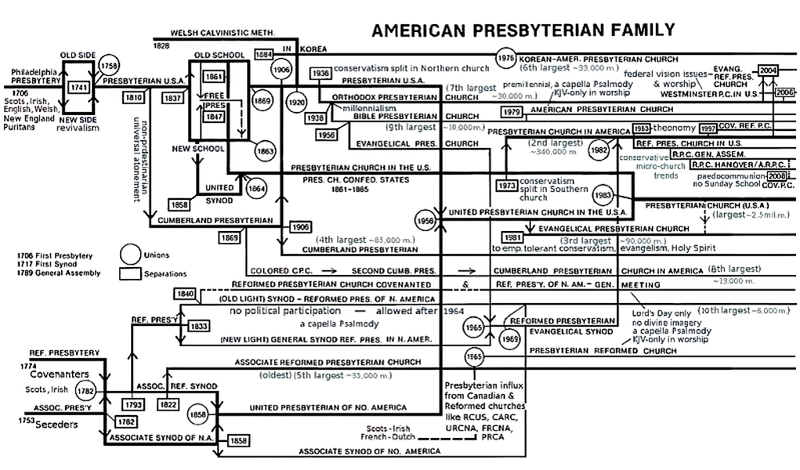 Here is a chart of the Family Tree of the Presbyterian Church USA, not be confused with the Orthodox Presbyterian Church, the Evangelical Presbyterian Church, the Associated Reformed Presbyterian Church (not be confused with the Reformed Presbyterian Church-Evangelical Synod) the Cumberland Presbyterian Church or any religious body that goes by the name Presbyterian. It is a veritable split pea soup of dissent. And in the face of all this, Jesus prays that we, his followers, should be one. The passage I just read tells us what Jesus prayed on this last night with the disciples. This was an important part of Jesus’ prayer, because he repeats it a few sentences later. 20 “I ask not only on behalf of these, but also on behalf of those who will believe in me through their word, 21 that they may all be one. As you, Father, are in me and I am in you, may they also be in us, so that the world may believe that you have sent me. Jesus prays that the disciples, and not only them, but all who follow them, which is us, would be one, just like Jesus and the Father are one. 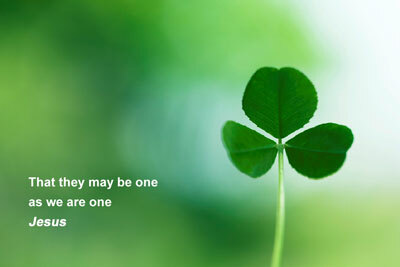 So what does it mean to be “one”? In Madeleine L’Engle’s book A Wrinkle in Time, she describes a society that is One in the sense of the term Monos, and it is very oppressive place. All the little boys go out at the same time every day and bounce the same kind of ball against the same kind of wall, and then they all go back inside at exactly the same time. Everyone has the same things for dinner every night. There is no complexity, no difference—no real thought, no real life. That is not what Jesus means. He does not mean that we all have to look alike and sound alike. When I first started taking Jesus seriously, in high school, I noticed that a lot of Christian leaders wore a certain type of clothes—so I got those kind of clothes so I could “look like a real Christian.” It did not take me too long to figure out how silly that was! I fell in with a certain kind of church, that was pretty different from the Presbyterian Church, and I figured that the way that church believed was how I was supposed to believe, and worse than that, that was how EVERY CHRISTIAN should believe. So for a while I began to think that if you not follow the theological teachings of this church, then you really weren’t a Christian, at least not a REAL Christian. One thing I learned along the way, and one thing I really do appreciate about the Presbyterian Church is that historically, it is not up to us to say who is or who is not a Christian. That belongs to God and God alone. So when Jesus was praying that we be one, even as he and the Father are one, what did he mean by that? 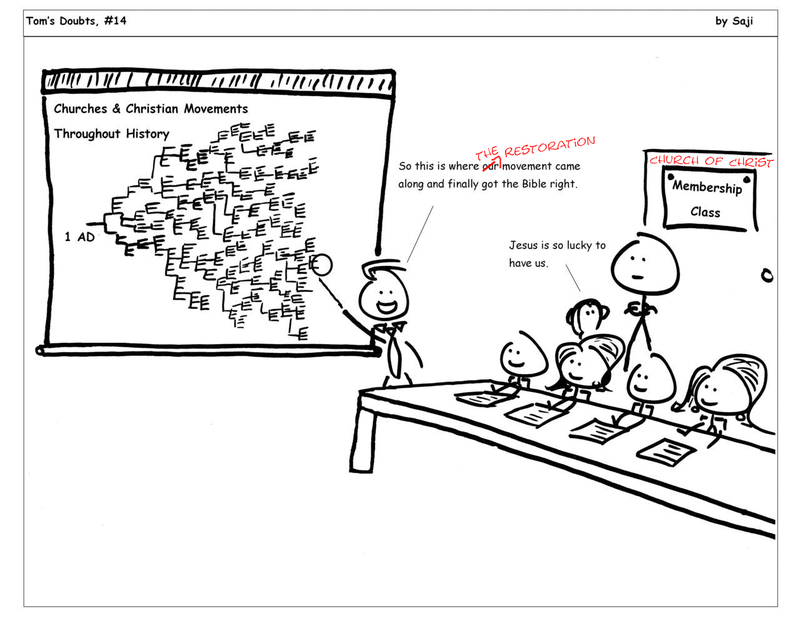 If we look at the New Testament, a pretty specific picture emerges. At Pentecost, which we will celebrate next week, people from a wide variety of language groups come together, and are brought into the fold of the new Jesus Movement. In the book of Acts, all sorts of people are brought into this new thing which will called the church—Widows and orphans, upstanding religious people, outcasts such as Samaritans and Eunuchs, people from many different nations, Gentiles of all stripes. In fact, as you look at the Church of Jesus Christ, throughout all of history, one thing that stands out is how diverse it has always been. It is not tied to a language, for the Gospel is preached in almost every language that is spoken on earth. It is not tied to geographic area, for there are churches all over this world. It is not tied to any one culture. The church existed in Rome, Greece, Asia Minor, the Middle East, and now exists all over the world. There are churches in Russia where their liturgy comes from the seventh century and the choral music is elegant and as complicated as any classical music piece, and there are churches in Africa where they use banana chips for communion, and dance wildly as part of the service. I was telling Ginni last week that in some African-American churches the organist provides a soundtrack for the preacher, punctuating the sermon with flourishes and rolls. There is a church in Korea that has 800,000 members, and where the great majority of the service is spent in fervent prayer. There are holy rollers and High church liturgists, Bible thumpers and Bible Doubters, High Church, Low Church Wide Church, Narrow Church, and Barely There Church. There is the Churches of All Things Done Decently and In Order, and there is the Free For All, Shout for Joy Church. The kingdom of God ranges from the First Presbyterians, Baptists, Methodists and Lutheran, to the First Bible is True and Right Holy and Sanctified Apostolic Fellowship of True Believers. There are people who do things that make you proud to be a Christian, and people who things that make you wish Jesus had remained a carpenter. And in that diversity, we are one world-wide church. The beauty of the Christian Church is that it can have many, many different expressions. What holds all these various expressions of the faith together is our common insistence that, however we define it, Jesus is Lord and savior. We are held together, not by a common culture, or a common language or even a common theology. We are held together by the person of Jesus Christ, by the power of the Holy Spirit, and by the hand of a loving Father. That is what makes us the Church. We are not the Church because we have the word “Church” on a sign out front. We are not the Church because we call ourselves one. We are not the Church because we are, officially on paper as a 501(c) 3 Religious organization. We are the church because we are children of God who gather to worship. When Jesus prayed, he said to God, The glory that you have given me I have given them, so that they may be one, as we are one, I in them and you in me, that they may become completely one, so that the world may know that you have sent me and have loved them even as you have loved me. There are a lot of people worried these days because churches are losing members, because more and more people are saying that they are “spiritual” but not “religious” and the fact is, we have no one to blame but ourselves. Jesus said that the world would know that he was sent from God, that what he said was what God would have us do, IF the Church was one. We have given the world plenty of reasons to not believe that Jesus is the Way to anything. Now, we will have our fights. The church has always fought about issues, and it will continue to fight about issues, from which way to process in the sanctuary to whether a Christian can own slaves to whether we should ordain women. And it is ok for us to have fights. Currently the Church is fighting about how we perceive our notions of salvation, whether Jesus is the absolutely only way to God and whether we should ordain and marry gays and lesbians. Those are important issues, and I am not saying that we should just avoid in the name of a shaky peace. But we have to understand, and this is the long term sin of the church, that when we disagree we are disagreeing with other children of God, and that we are not defined by our agreements or disagreements. We are not defined by how perfect our theology is, but how we respond to the love of God. And if one of our responses is to shut other people out who disagree with us, or who practice differently from us, then we are responding poorly to the love of God. If, on the other hand, we can look our brother or sister in the eye, and say, “I think you are dead wrong, but I love you as a brother or sister in Christ,” then we are responding rightly to the love of our Heavenly Father. In one sense, the woman who led me on that art tour in Germany was dead wrong. We cannot split the Body of Christ. We may THINK we can do that, but in reality we cannot. Churches who split from other churches, who leave their denominations, who go off to start new things are only doing something on paper. It has no effect in the Kingdom of God. We cannot split the church any more than we can create the Church. It is God’s church. We might say to other brothers and sisters in the faith, “I don’t think you are a part of the family,” but that is like when I was a kid, and would tell my brother that he really wasn’t a part of the family, that we found him somewhere. Saying it, even putting it on paper, does not make it true. So the really sad part is that often we ACT like we are separated. We act like we have been split up. We act like we are separate groups, running around doing the work of God all on our lonesome. This table reminds us of our oneness in Christ. We call the meal “Communion” which means we all share a common relationship. We are not invited to the this table because we are such great people, but because we are the people of God. That means we have no right judging who else is at the table. We are not judged by what we bring—our beliefs our practices, what we have done in our lives, nor can we judge others by what they bring. We are invited to this table because God loves us. The night he was arrested, Jesus prayed. One thing he prayed was this: 22 The glory that you have given me I have given them, so that they may be one, as we are one, 23 I in them and you in me, that they may become completely one, so that the world may know that you have sent me and have loved them even as you have loved me. This entry was posted in Church, Emergent Church, Jesus, ministry, Presbyterian, spirituality, Worship and tagged Christian Unity, church, dissension, Jesus, Unity. Bookmark the permalink.